Truth be told I set out to Michael's to buy stuff to make the loved one's girls their 2016 Halloween Trick-or-Treating bags. I had received an email from Michael's for that day or week's coupon and without even knowing what would be on sale I just went. I do/did not have a lot of opportunity to make these this month because of travel plans so I knew I needed to just pick up a few things and knock them out. However, upon entering the store I discovered that all Halloween EVERYTHING was 50% off plus I had my coupons (40% off one non-sale item and 20% off total purchase). Score. After meandering around the entire store in search of some pre-cut felt items like I happened to find last year I had managed to convince myself that yes, indeed, I WOULD make them a Halloween wreath. After all, the fall wreath I made last year was super easy! So back and forth up and down the aisles I went a second time to procure the essentials I wanted to use. I'm a rule follower to the max, therefore I played it safe and picked up similar things as I used to make the fall wreath only each of these things were Halloween themed. Without regard to costs I loaded up my cart with items for the wreath, items for the bags, and a bunch goodies/treats to put in the bags as gifts. I was shocked to discover my total purchase. After the 50% off Halloween items, 40% off coupon applied to the grapevine wreath not on sale, plus 20% total purchase I totaled out at $59! I sat down this morning to calculate the actual cost of the wreath items: $31.63. Yep. I rounded up in the title a bit because your coupons may vary and sales may vary so of course, you could end up spending closer to $40 (or more depending on what you buy). The felt items and garland were for the Trick-or-Treating bags, everything else was for the wreath. 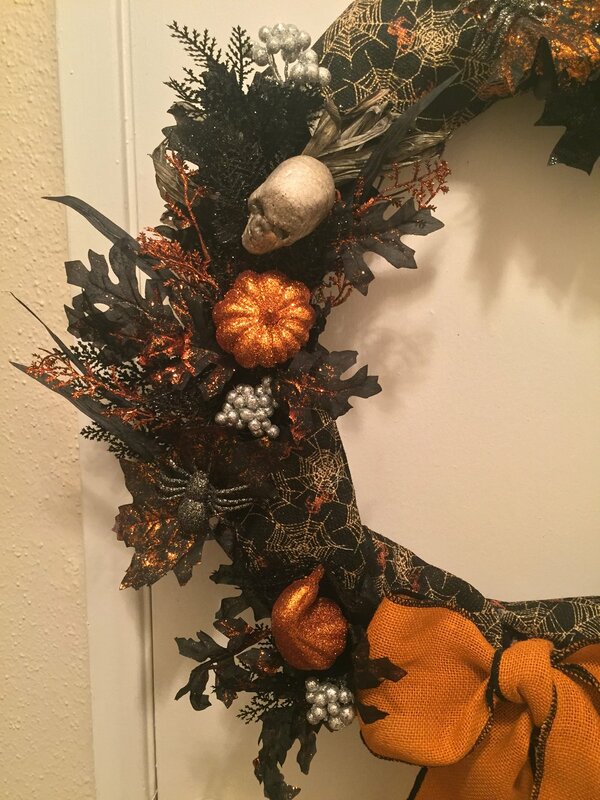 Items purchased for the wreath: 24" grapevine wreath, orange burlap ribbon, black spiderweb burlap ribbon, white gauze (didn't end up using), and five spooky floral stems (some with just black or orange leaves, and some with pumpkins or spiders and skulls on them). $32 of magic right there. When you're finished filling in the wreath and making adjustments, you can attempt to make a bow. I say attempt because that's all I can do. They did not have a pre-made Halloween burlap bow. Whoa was me. I considered not even adding a bow because I am that terrible at making one. But, I tied a basic bow anyway, pulled floral wire through the base of the bow to secure it to the wreath, then used a lot of hot glue to slowly and carefully attach the bow to the wreath permanently. Once you have this completed, you can begin to carefully secure the floral stems and decor attachments. I work one section at a time, lifting up the items a tiny bit to get the hot glue gun underneath it, and carefully coat the stems to the wreath. Take your time doing this, it's not a race and you want it to be secure AND look good, not have hot glue showing everywhere!